Huli-Huli inspired Chicken Bites. This super fun Hawaiian treat will have you coming back again and again. Everyone is gearing up for the big game on Sunday. I think there’s a combination of cold weather misery striking the nation right about now, with the reoccurring cold up north and the recent snow causing a stand still in the south, and we all just need a reason to get together and have a good time. I don’t even think it matters who is playing this year or what the funniest commercial is (though this commercial for Jaguar has already made me nerd happy). While you’re sitting around hanging out with friends and family this weekend (and I do hope that mother nature holds off for a day or so just to let us get this unofficial holiday in), much on these Huli-Huli inspired chicken bites. 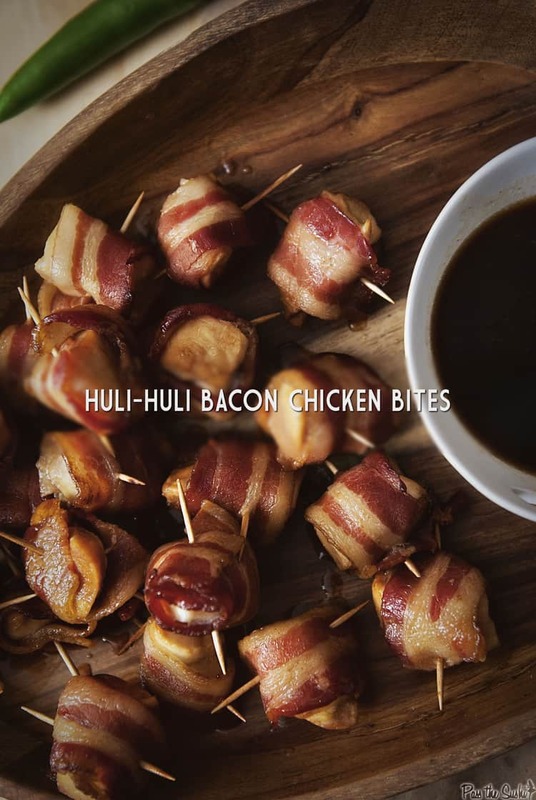 If you’ve tried this Huli-Huli Bacon Chicken Bites recipe, or any other recipe on passthesushi.com please don’t forget to rate the recipe and let me know where you found it in the comments below, I love hearing from you! You can also follow along for more good eats and travel tips on Instagram @passthesushi & @girlcarnivore, Twitter & Facebook. 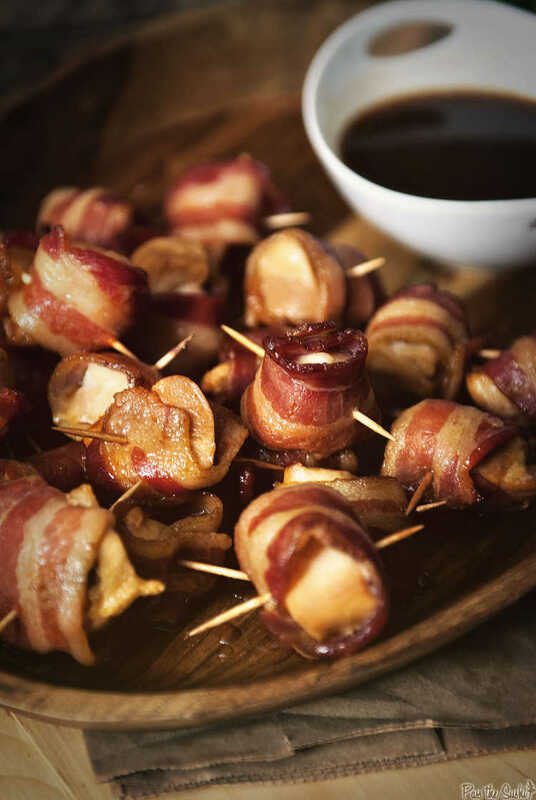 And because we all love bacon, try these. Preheat the oven to 425 degrees F. Line a baking sheet with foil and place an oven safe wire rack over top. Cut each chicken breast into 1" cubes, about 12 per (24 total). Wrap each in bacon and insert a toothpick in the center to secure. Arrange on wire rack in a single layer. 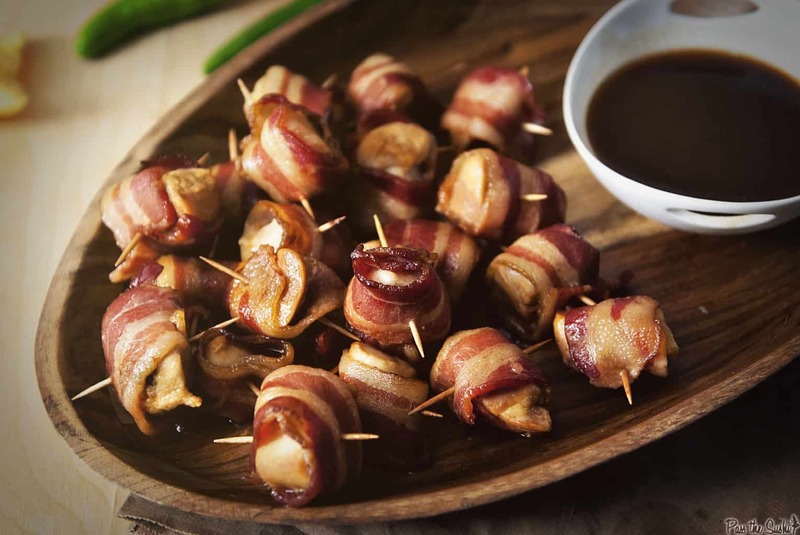 Sprinkle brown sugar heavily over the bacon bites. Bake for 25-30 minutes, until bacon is crispy and cooked through. Meanwhile, in your slow cooker, whisk together the pineapple juice, teriyaki sauce, Worcestershire sauce, rum, ketchup, and cayenne. When bites are cooked through, carefully transfer to slow cooker and toss with sauce. Cover and keep on low to heat through. Top with scallions if you're feeling fancy to a hungry crowd. Oh I love huli huli sauce. Never thought to use it in an appetizer recipe somehow. Yum! Never heard of this but it sounds awesome!! Wow. I’m not a big drinker but I love it in foods and heck if I’m not going to head out to the ABC store and buy me some of the Captain’s good stuff. You don’t have to convince me that this is the good stuff.